More than half of Americans (53%) now say religion is very important in their lives, according to a recent Pew Research Center report. While this figure has declined somewhat in recent years – down from 56% in 2007 – Americans remain in the middle of the pack in terms of importance of religion when compared with people around the world. 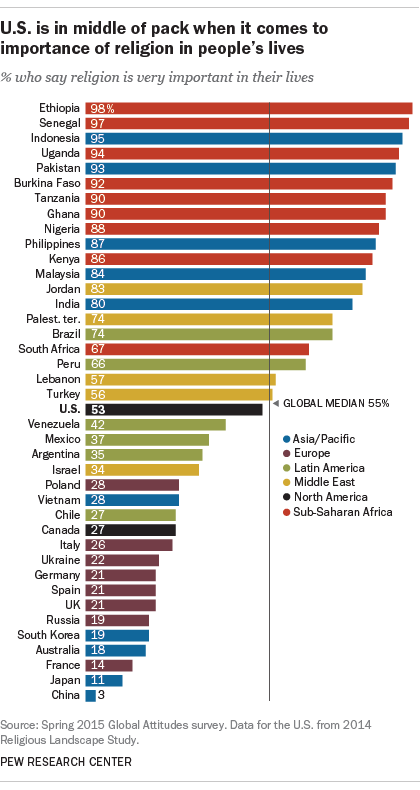 In fact, the share of Americans who say religion is very important is close to the global median of respondents who say this in a separate survey. By this measure, Americans place less importance on religion in their lives than do people in a number of countries in Africa, the Middle East and Asia. For example, nearly universal shares of Ethiopians (98%), Senegalese (97%) and Indonesians (95%) say religion is very important, as do eight-in-ten or more Nigerians (88%), Filipinos (87%) and Indians (80%). Countries where religion is broadly seen as important have a variety of religious makeups, ranging from predominantly Christian nations like the Philippines, to mostly Muslim countries like Indonesia, to Hindu-majority India and even to some religiously mixed countries like Nigeria. Meanwhile, religion is considerably more important to Americans than to residents of many other Western and European countries, as well as other advanced economy nations, such as Japan. 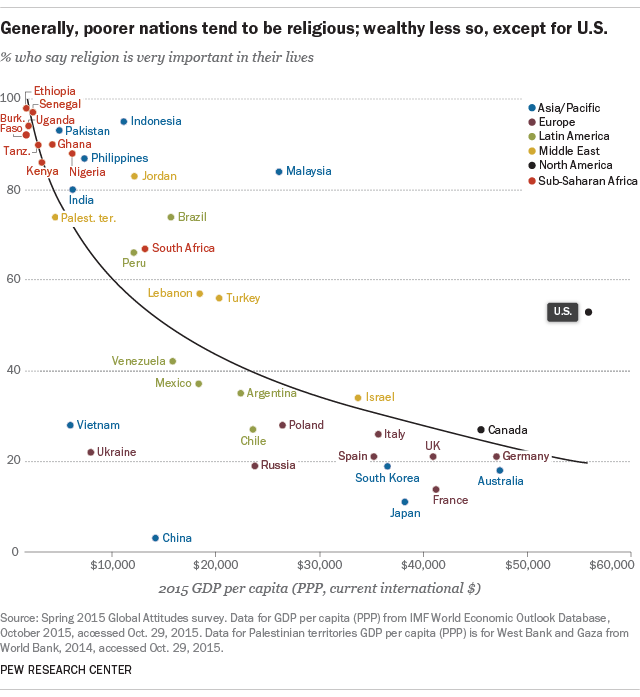 Overall, people in wealthier nations tend to place less importance on religion than those in poorer nations. However, the United States – the wealthiest nation included in the 2015 global survey based on gross domestic product per capita – is a notable exception to this trend. Americans are much more likely than their counterparts in other economically advanced nations to say religion is very important. About twice as many or more Americans say religion is very important in their lives compared with the share of people who say this in Australia (18%), Germany (21%) and Canada (27%), the next three wealthiest countries included in our survey. The U.S. — which, like much of Europe, has been experiencing a rise in the share of people who say they have no religion — is also near the middle when it comes to the share of people who say religion is “not too” or “not at all” important in their lives. About one-in-five Americans (22%) say this, compared with a global median of 13%. In 14 countries across Africa, Asia and the Middle East, few, if any, say religion is not too or not at all important in their lives. By comparison, France (61%), Japan (58%) and Australia (56%) are among several countries where majorities say religion is not too or not at all important to them. Note: See here for topline results on importance of religion and methodology.